All too often students find themselves wondering where a particular color has come from. They set out to create a bright green with a blue and yellow watercolors but they do not quite get the color mixture they were after. Instead of a bright green they end up with one which is quite dull. To help understand what is going on we will talk about what I can the color mixing formula. The cause of this is often a lack of understanding of the impure colors which make up most of our primary color (Blue (B), Red (R) and Yellow (Y)) pigments. Most blues are not pure blues, and the same applies to the yellows and reds. Before we investigate this further, we need to remember that if you mix blue, red, and yellow you should end up with a dull grey to black color depending on the proportions of each color mixed. 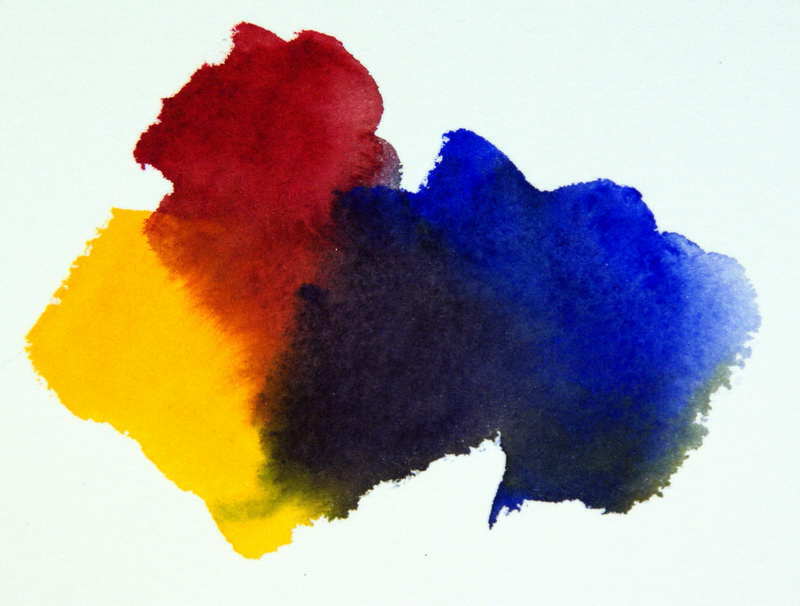 Figure 1: Mixing a Blue, Red and Yellow will give you a dull grey to black color depending on proportions of each color mixed. So whenever these three colors come together in your mix of paints your resultant color will not look bright but will instead look a little dull. If only two primaries are mixed together then a bright secondary color will result – it is the addition of the third primary which dulls colors off. So what do we mean by impure colors. Well, it means that the main color, such as the blue in the case of French Ultramarine, has tiny additional amounts of one or both of the remaining two primary colors, in the case of French Ultramarine it is a small amount of Red. This is why it is called a warm blue. Because of this the trick to predicting your resulting color from your mixes is not just to think of your colors as one (blue, yellow, red) but to look at them as their component parts. For example, French Ultramarine is a Blue (B) with a tiny bit of Red (r), Alizarin Crimson is a Red (R) with a tiny bit of Blue (b). Here I am using upper and lower case letters to reflect the relative quantities of each Primary in your typical. This way of looking at colors however would apply to all brands of artist watercolor paints. In the next section we will look at this color mixing formula in more detail to see how it can help us mix brighter or duller colors at will.